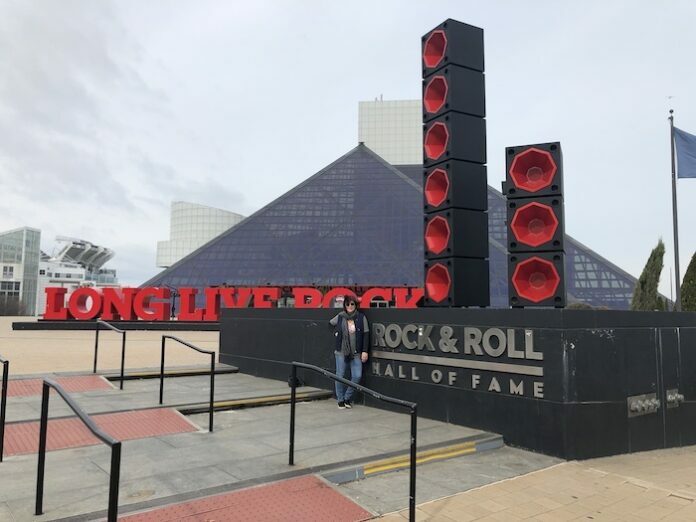 Home Lifestyle Entertainment The Rock & Roll Hall of Fame: What’s There for Christians? In the 1950s, Alan Freed, a disc jockey on WJW radio in Cleveland, started calling the mixture of R&B, country, and blues records, rock ’n’ roll. He took what was a sexual euphemism and applied it to music. For good or ill, it stuck, and it’s what our society continues to call guitar, bass, drums, and singer-led bands. When the decision to build a hall of fame was made, Cleveland won the bidding and in 1993, a groundbreaking ceremony was held on the shores of Lake Erie very near Municipal stadium (home of the Cleveland Browns). The Rock & Roll Hall of Fame opened its doors September 2, 1995, accompanied by a huge concert at Municipal Stadium. The extravagant show was highlighted by performing greats, Chuck Berry, Bruce Springsteen, James Brown, Johnny Cash, Booker T. and the M.G.s, Bob Dylan, Jerry Lee Lewis, and the Queen of Soul herself, Aretha Franklin. Cleveland pulled out all the stops with a grand parade and a star-studded ribbon-cutting ceremony. As the lakefront at the end of East 9th street has changed and grown since 1995, so too has the Rock Hall. 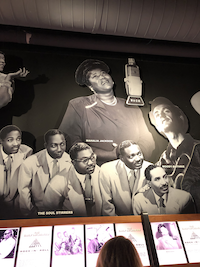 In an effort to keep up with the ever-changing styles of music, the Hall seeks to keep the history of many of the emerging genres immersed in its origins. The building, designed by I.M.Pei, has a modern spire rising to a point, and it is reflected in the logo of the museum, which looks like a guitar fretboard in perspective. Very cool. Jutting off on the west side is a large tower. 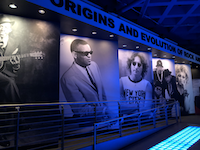 Inside, seven floors are solid with collections from icons of music. 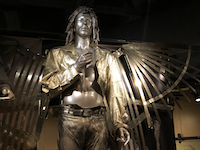 Jim Morrison’s cub scout shirt, original posters from famous concerts, hand-written lyrics from many musicians (e.g., Joe Walsh’s Life’s Been Good), stage attire, instruments, and personal items such as Janis Joplin’s psychedelic painted Porsche fill the space. But what fills it even more is the music. From the moment a visitor enters the grounds of the museum, music is the welcome from hidden speakers. Stepping into the light-filled atrium, it’s music, music, music. 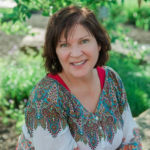 Staff members are front and center and epitomize courtesy and service. 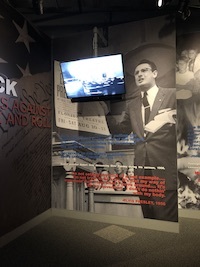 The tour starts on the bottom level and wrist-banded guests are directed to start their tour in the Ahmet Ertegun Main Exhibit Hall (He founded the Hall of Fame), where the history of Rock & Roll is portrayed in photographs, listening stations and stories of the forerunners who influenced the stars we listen to today. Okay, so not all music is holy. We know that. But not all music lacks some redemptive quality. 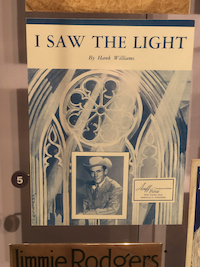 The presence of inductees, Aretha Franklin, Sister Rosetta Tharpe, the Staples, and Hank Williams (with “I Saw the Light” playing in the background) in the collection made sure there was presence of the Spirit. I am sure there are other believers in the museum, but these three stood out. As I meandered through the collection, the j oy of music was overshadowed by the exaltation of “self.” To this visitor, the music was replaced with an over-amped view of the musicians. And then the stage gear, lights and outfits became more and more outlandish (still do). As the self became more prevalent, the rooms felt darker. Any strong believer will feel it. But if you love music, you can get past the dark underbelly of some of it and simply enjoy the songs. Older fans can re-live the moments when they first heard the Beatles or the Stones, or for younger fans, U2, The Cure, and contemporary hip-hop artists (an artist or group can only be inducted twenty-five years after the release of their first commercial recording, and then by submitted ballots and the top five vote getters by fans). One of the sensory delights is the video playing highlights of past induction ceremonies. Groups who arrive at the time of showings are led into a raised-seat auditorium. Vertical columns of speakers line both sides of the stage and a multiplex screen plays a fifteen-minute concert of performance clips. The one currently playing drew applause from the crowd. Yes, it’s that good, especially with the effects of subwoofers in the seats. It was a rocking good experience. Go ahead and laugh; it is such fun. If you love music, you’ll thoroughly enjoy a visit. 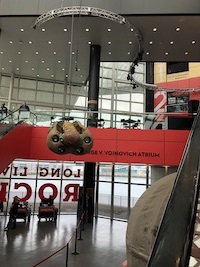 The Rock & Roll Hall of Fame sits two doors down from the Browns’ Stadium, right next to the Great Lakes Science Center, with Lake Erie as its backdrop and the skyline of Cleveland as the curtain. It is open every day except Thanksgiving and Christmas and closed for occasional special events.